B&H has the new Canon EF 16-35mm f/2.8L II USM Lens in stock! Adobe Creative Suite CS3 along with the individual packages including Photoshop CS3 is now available for preorder from Amazon.com. Adobe has formally announced Creative Suite 3. Act fast if there is something you want - quantities are usually very limited. Looking for more memory (for your camera of course)? J&R has the Sandisk 16GB Compact Flash Extreme III Memory Card for only $249.99. Check out the prices on the other Sandisk 16GB Compact Flash Extreme III Memory Cards while you are there. And Adorama has an excellent price (1 week only) on Kingston Technology 8 GB, 45x Elite Pro Compact Flash Memory Cards - $49.95 after rebate. Adorama has a large list of "Refurbished By Canon" Lenses and Cameras right now. 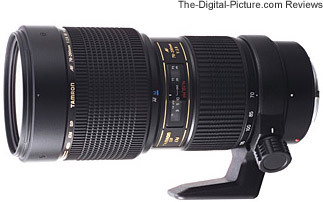 Included are all 4 of the Canon 70-200 L lenses - with the 70-200 f/4L IS listed at $900. Adorama's inventory has historically been depleted before the item listing is removed from the web site. Act fast if there is something you want. 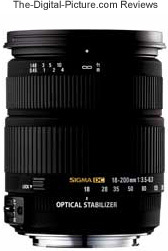 2007.3.8: The Sigma Corporation is please to announce the launch of the new 18-200mm F3.5-6.3 DC OS lens. This 11.1 times high magnification zoom ratio lens is exclusively designed for digital SLR cameras and is capable of covering a wide range of focal lengths from wide angle to telephoto. It is equipped with Sigma's own unique technology OS (Optical Stabilizer) function. This function uses two sensors inside the lens to detect vertical and horizontal movement of the camera and works by moving an optical image stabilizing lens group, to effectively compensate for camera shake. It also automatically detects movement of the camera and compensates for camera shake when shooting moving subjects such as motor sports. * Equipped with Sigma's own unique technology OS (Optical Stabilizer) function. If you did not notice the specs on the 200-500mm lens, look again. Then, take a look at the picture in the press release - This is an impressive-looking lens! Didn't we see this >18-200 OS announced before? This press release was placed online 9/26/2006. While overall dimensions are confined to the absolute minimum, the new SP AF70-200mm F/2.8 Di LD (IF) MACRO zoom lens is packed with features that allow stress-free photography: a versatile MFD (minimum focusing distance) of just 0.95m (37.4) over the entire zoom range; an excellent maximum macro magnification ratio of 1:3.1 at f=200mm; and an advantageous internal focusing (IF) system. The new tele-zoom lens enables the user to cover a desirable focal length range of 70mm medium telephoto to 200mm telephoto when mounted on full-size format SLR cameras and a focal length range from 109mm to 310mm equivalent* ultra telephoto (7°59' angle of view) when mounted on a DSLR camera with an APS-C sized imager. This zoom lens, designed for use with full-size format SLR cameras, boasts a fast maximum aperture of F/2.8, yet it allows close-focusing down to 0.95m (37.4) over the entire zoom range. The maximum magnification ratio is 1:3.1 at the 200mm tele-end. The filter diameter is confined to f77mm as a result of the use of an advanced optical design pursuing optimum optical power distribution. The lens features a fast maximum aperture of F/2.8, yet it weighs a mere 1,112.6 grams (39.2oz. )*, since it uses barrel parts made of engineering plastic materials having excellent dimensional stability and sufficient strength for professional use and even industrial applications. (*) As of February 2007, based on Tamron's research of lenses in the same class, excluding the tripod base. Through the use of "Internal Surface Coatings (i.e., multiple-layer coatings on cemented surfaces of plural elements) and multiple-layer coatings to prevent reflections from lens surfaces, ghosting and flare due to reflections that occur when light enters through the front element as well as reflections caused by the imager itself in the mirror box are reduced to the absolute minimum. The models for Nikon and Canon cameras are equipped with AF/MF switchover mechanisms to allow one-touch switchover from AF mode to MF mode or vice versa electronically and mechanically by simply sliding the button. (Sony and Pentax systems require AF/MF switchover operation on both the camera and lens.) Since the lens uses an IF (internal focusing) system, the focusing ring does not rotate during focusing, which ensures good holding balance at all times. In the MF mode, focusing is performed as easily and comfortably as with an MF lens. Since the overall length of the lens does not change due to zooming or focusing, it offers excellent operability and holding balance. When the AF28-300mm F/3.5-6.3 XR Di VC is used with a full size format SLR camera, it covers the tremendous focal length range from 28mm in wide angle to 300mm ultra telephoto. When mounted on a DSLR with an APS-C sized imager, the lens covers a 43mm wide angle to 465mm equivalent ultra telephoto* (full size format equivalent, in a diagonal angle of view of 5°20'). 1. VC (Vibration Compensation) Mechanism Reduces Hand-shake The proprietary VC (Vibration Compensation) mechanism developed by Tamron features a triaxial configuration using three pairs of driving coils and slide balls around the compensator group of the lens' optical system. Since the compensator lenses are supported with rolling friction of the balls, the response performance is enhanced and the construction is simple, which results in the compactness of the lens. The lens incorporate a highly accurate gyro sensor for detecting hand-shake, which, combined with a 32-bit RISC CPU, offers comfortable anti-vibration effects. 2. Outstanding Design Realizing High Zoom Power, VC Mechanism and Compactness The AF28-300mm F/3.5-6.5 XR Di VC integrates optical technologies that Tamron has accumulated as the pioneer and leader of high power zoom lenses in order to realize the desired compactness even while incorporating the VC mechanism. The optical system uses a number of lens elements made from special optical glass materials including XR (high refraction index) glass elements, GM (glass-molded aspherical lens) elements, hybrid aspherical elements, LD (low dispersion) glass elements to compensate for on-axis and lateral chromatic aberrations and AD (anomalous dispersion) glass element. The lens offers high contrast, high resolution performance and flatness of the image field as a one-does-it-all zoom lens designed to match the characteristics of DSLR cameras. 3. Revolutionary MFD of 0.49m (19.3") throughout the Zoom Range Provides 1:3 Macro Magnification Ratio The AF28-300mm F/3.5-6.3 XR Di VC LD MACRO boasts an MFD (minimum focusing distance) of 0.49m (19.3") over the entire zoom range, a top-class closing focusing capability among high power zoom lenses for full-size format SLR cameras, which provides the remarkable maximum macro magnification ratio of 1:3 at the 300mm telephoto end. 4. Internal Surface Coatings Minimize Ghosting and Flare Through the use of "Internal Surface Coatings" (i.e., multiple-layer coatings on cemented surfaces of plural elements) and multiple-layer coatings to prevent reflections from lens surfaces, ghosting and flare due to reflections that occur when light enters through the front element as well as reflections caused by the imager itself in the mirror box are reduced to the absolute minimum. 5. Ultra-high Zoom Power, yet Lightweight and Compact Design Thanks to New Mechanical Devices Tamron has reviewed the roles that respective barrel parts play in order to achieve the high power, compactness and light weight. As a result, dimensional increases are confined to a mere 17.8mm (0.7") in overall length and about 5mm(0.2") in diameter, when compared with the existing AF28-300mm (Model A061), despite the incorporation of the VC mechanism. 6. Zoom Lock Mechanism for Enhanced Portability The zoom lock prevents unwanted barrel extension when carrying the lens/camera combination over the shoulder. 7. Flower-shaped Lens Hood A flower-shaped lens hood is included as a standard accessory. The special hood provides optimum shading of superfluous light rays that enter from the rectangular frame outside the image field. 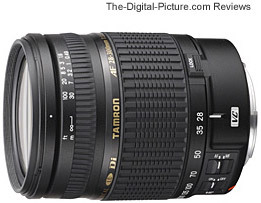 Tamron's lens names are super long, but the "VC" is a notable. "VC" stands for vibration compensation.